Good News! I won $100 in the Rhode Island Lottery Raffle. The bad news? I already spent it. It was money well spent though, I can tell you that. I bought a new pair of sneakers. Let me tell you, it's like running on air. 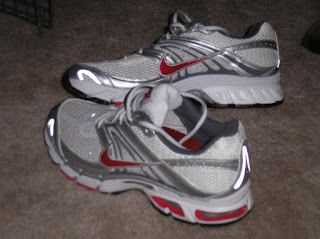 I bought the same style from Nike that I had when I was running a few years ago. It was a good choice. They fit like a dream. I was having shin pain from my last pair so I knew I was going to have to invest in a new pair. It was either new shoes for work or new running shoes. While I had that internal debate with my self, I won some prize money, argument settled. Woohoo!!! So I ran for a bit this morning before heading out to do some grocery shopping. Now I am relaxing at home, the kittehs are curled up asleep on my bed and I am listening to the movie "Clue" while catching up on some things on the computer. It was made in the early 80s, but "Clue" never gets old. Madeline Kahn is just brilliant as is the rest of the cast.